The Snow and Ice CAL got off to a fantastic start last week, with so many of you getting your yarn and joining in with the first instalment. A lovely pile of blocked squares from Ingrid Hottart. It's so satisfying watching the stack grow! Andrea Hazzard has made lots of progress on the squares. Looking lovely, Andrea! Jo Duke has also been busy over the weekend! Thank you for sharing your photos with us, please keep them coming. The second instalment of our Snow and Ice CAL is the Puff Stitch Square. This square is made up of a series of puff stitches which are created by making several loops on your hook and then all pulled together to make a thick and squishy fabric that's perfect for a blanket. Keep scrolling for our How-To guide including clear images of each stage, making it simple to follow. With 3.00 mm hook, make slip knot on hook. Take yarn over hook and pull through. This creates a chain stitch (ch). Repeat seven times more making 8ch. To join with a slip stitch (slst), insert hook through the first ch. Take yarn over hook and pull through all loops. This makes the ring that you'll be working in to. Now you'll begin your first round by working 2ch, half treble four together (htr4tog) into ring thus: yarn over hook and into ring. Yarn over hook and pull through. Yarn over hook again and into ring, pull this loop through. Repeat a further two times. Yarn over hook and pull through all 9 loops on hook. Work 2ch, then work puff stitch seven times into ring with 2ch in between. Th puff stitch is very similar to the htr4tog except that you are working into the chain loop five times instead of four. Yarn over hook again and insert into ring, yarn over and pull through. Repeat another three times so making five in total. Repeat round referring to the pattern. Begin the second round by working 5ch, which counts as 1 tr (UK treble) and 2ch. 1 tr in base of 5ch. To make tr, yarn over hook, insert hook into st.
Yarn over hook and pull through, you should have three loops on hook. Pull through two loops on hook. Pull through remaining two loops on hook. Work 2ch, puff stitch in next space formed by the 2ch worked on the previous round (2-chsp), work 2ch. Puff stitch in next 2-chsp, work 2ch. 2ch and 1tr all in the space at the top of next puff st of the previous round. Continue round referring to the pattern. You will begin to see the square shape forming. Begin the third round with a slst in first 2-chsp, 5ch. 1tr in same place as slst. 2ch, work puff stitch in each 2-chsp, working 2ch in between each one. Work 1tr, 2ch and 1tr in next corner of the square. For the fourth round you slst in first 2-chsp, work 5ch, then 1tr in same place as slst. 2ch, work puff stitch in each 2-chsp four times, working 2ch in between each one. Work 1tr, 2ch and 1tr in all corner 2-chsp. Work slst in first 2-chsp, 5ch. 1tr in same place as slst, 2ch. Work puff stitch in each 2-chsp five times, working 2ch in between each one. Work 1 tr, 2ch and 1tr in all corner 2-chsp. Complete round referring to pattern. Now we're on to the final round. Work 1ch, 3 double crochet (UK dc) in corner 2-chsp. To do the dc, insert hook into st, yarn over hook and pull through. Work 1dc in next tr, 2dc in next 2-chsp. Work 1dc in each puff st and 2dc in each 2-chsp five times. 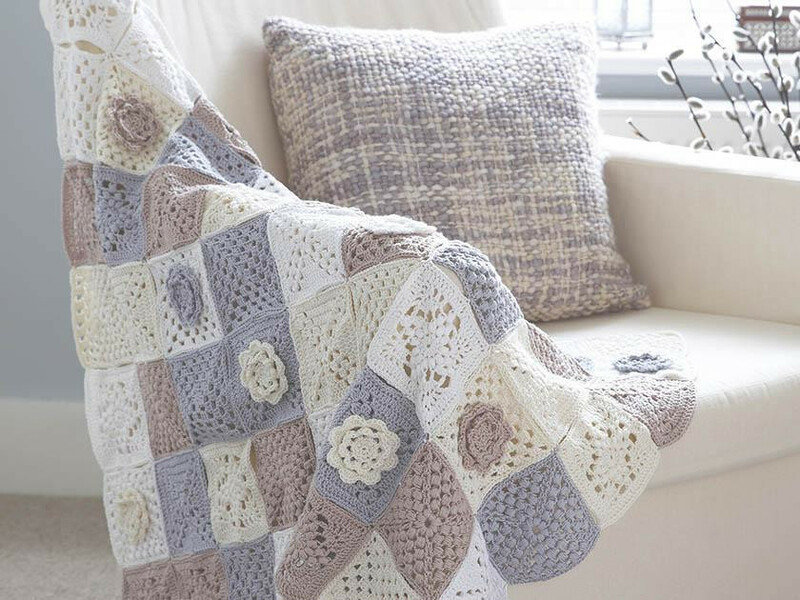 Weave in the ends and make another 13 squares in this pattern to add to your blanket. Don't forget to share photos of your blankets in progress over on The Knitting Network Facebook page, we would love to see how you're doing!